A reward of $10,000 is available for information that leads to whomever began the fire. The Hill Fire burns in the hills west of Conejo Center Drive in Thousand Oaks, Calif., on Thursday, Nov 8, 2018. The Hill fire that began burning Nov. 8 in Ventura County was caused by human activity, investigators confirmed. 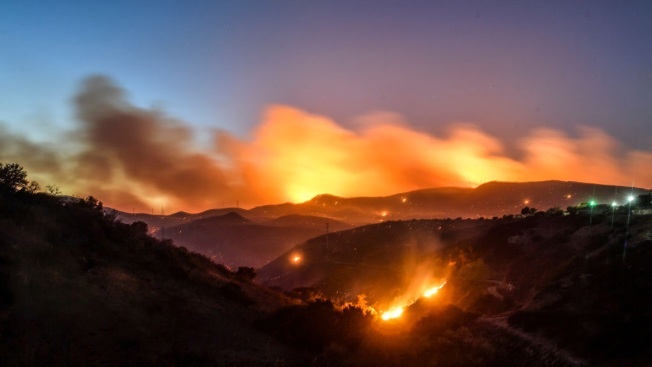 The Ventura County Fire Department, Ventura County Sheriff’s Office and CAL Fire ruled out all other potential causes before reaching a conclusion on the incident. The brush fire scorched thousands of acres in the Hill Canyon in the Santa Rosa Valley and forced mandatory evacuations and closure of the 101 Freeway. Fall is historically one of the most dangerous times of the year for wildfires in California. Seven of the state's 10-most destructive wildfires occurred in October -- many fueled by monster winds, including Santa Ana gusts. Through Nov. 4, Cal Fire has reported about 5,600 fires that burned more than 621,700 acres. During that same period last year, the agency reported 5,800 fire that burned 316,600 acres. Over the last five years, California has averaged 5,293 fires that burned 231,400 acres during that interval. The investigative team is asking the public to call 1-800-468-4408 if they have any information regarding the fire or saw anything or anyone in the HIll Canyon Trail area on Thursday, Nov. 8, 2018 from 10 a.m. to 3 p.m. The Hill fire is now 100 percent contained.